The Online HomeStudy Course is perfect for people on the go and those who are unable to go to a country where a Live Course is conducted. This gives you the option to plan your studies according to your own schedule. It also greatly serves those who prefer to learn in their own pace - reviewing the lessons over and over again until you get it.All these are achievable at the comfort of your own home. Give yourself an edge in life. 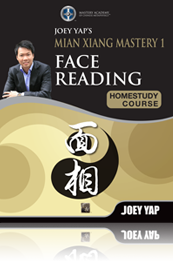 Joey Yap's Mian Xiang: Face Reading today.  Quizzes and Exercises at the end of each lesson: practice makes perfect!